Vanuatu’s Big Dogtooth on Poppers, Ocean Blue style! 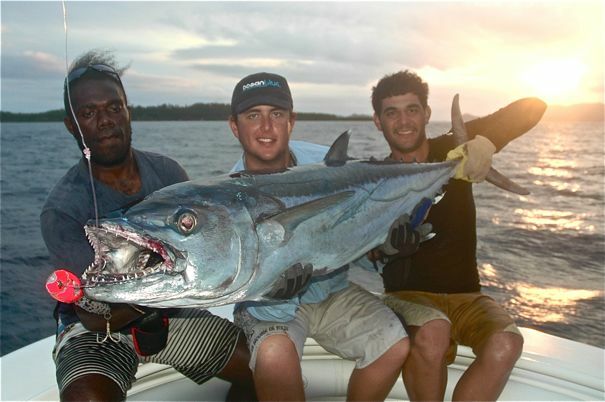 Ocean Blue’s Vanuatu Sportfishing guide, Andrea Traverso has always been passionate about dogtooth tuna. Big doggies are one of the most challenging species to locate, hook and land. They are armed with razor sharp teeth, power that can match the limits of any tackle & make blistering deep runs around reefs and dangerous terrain. No doubt they are hooked during charters targeting other species, this usually ends quickly and convincingly, with those onboard left speechless after a big dogtooth bust-off. 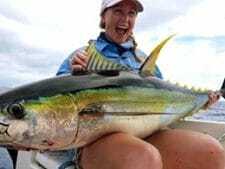 Andrea is continually studying new areas, refining techniques, testing the latest in popping and jigging gear all to increase the success rate when our anglers are targeting dogtooth tuna. The 32ft EdgeWater centre console ‘Azzurra’ gets you quickly and comfortable to out of the way areas and is set up perfectly for casting and jigging. The Ocean Blue Vanuatu team spent 3 days recently fishing and filming this kind of action, the result was ‘textbook’ with the following report a testimony to what they are achieving. Targeting doggies on jigs was the order of the day with some good fish landed and a number of bigger bust offs. The focus though was to experiment with raising these doggies on poppers. Ocean Blue stalwart Eric Festa was on board to lend a hand. 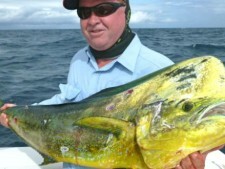 Eric, one of the most well respected angler’s in Vanuatu knew exactly what we needed to do…!!! It’s a well known fact doggies are nocturnal feeders so Eric’s suggestion…fish late. Dogtooth will feed on the surface later in the day. So at 4.30pm we halted our jigging and GT popping efforts and focussed on a few of Eric’s secret dogtooth haunts. Andrea was determined to land big doggies on poppers. Andrea casted a brand new Kaiser El Toro 125g popper. Within 10 minutes, the first doggie smashed the popper but missed…then pop, another miss, pop again and we’re on! Andrea made short work of his first doggie, landing a nice 20kg specimen. It didn’t take long for Andrea to have his popper back in the water and 3 casts later, pop, pop, whooshka, crunch…he’s on again! This fish was a little bigger & with line peeling off the Stella under heavy drag, Eric did well to lead the fish into deeper water. After a 10 minute ordeal a nice 30kg fish came on board for a quick photo. By this time light was fading and the fish turned on big time. After a few misses, a monster fish launched into the air, somersaulted with the shiny blue popper in mouth…Andrea was on again. This was a better fish! Andrea really put the pressure on, pushing his gear to the limits. Five minutes into the fight…crack!! His heavy popping rod snapped at the join. This didn’t stop quick thinking Eric and Andrea from landing the fish together. Eric worked the rod’s top section, the guys worked in unison, comically raising the fish inch by inch. After 20 minutes the guys, in hysterics managed to land the fish. The fish was a solid 40kg specimen, while the tale of this epic capture provided all on board with new levels of amusement. Having proved we can raise these fish on poppers the next 2 days we refined our techniques and gave it a real go. The fish didn’t disappoint with numerous landed fish, bust offs and plenty of exciting angling. Popping for dogtooth was visual and spectacular, on numerous occasions the fish were airborne. Definitely and exciting few days!